Villa Kebun was a great place to stay,close to beach, shopping. Nice quiet area. This villa had everything we could have wanted and more- loved spending time on the daybed especially and in the pool. Semi-outdoor bathrooms were wonderful. Staff service was impressive. We stayed for 7 nights and came back completely relaxed. The staff took real good care of us, the villa had everything we needed;rooms and beds very comfortable. We hope to come back to Bali and Villa Bugis soon! Close to beach, shopping and a wide range of eateries. We stayed in Vila Kebun and it was wonderful. Often you feel let down when you arrive at your destination to find that the photo on the internet doesn’t match the actuality – not here. We were delighted with everything and the kids had a fantastic time in the pool. Airport transfers were a bonus and proximity to shopping, food & beach are great. The staff were friendly and helpful. Will definitely book again. 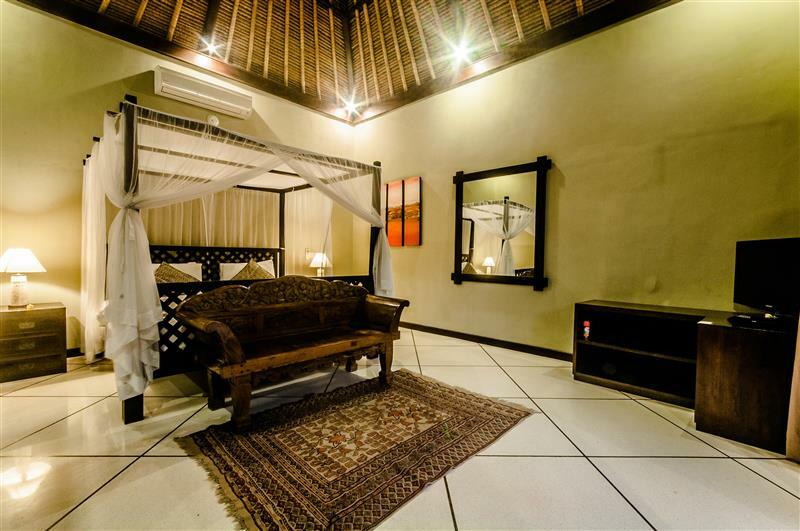 The villa has three king-sized bedrooms, with one attached to the main building and two within separate guesthouses. 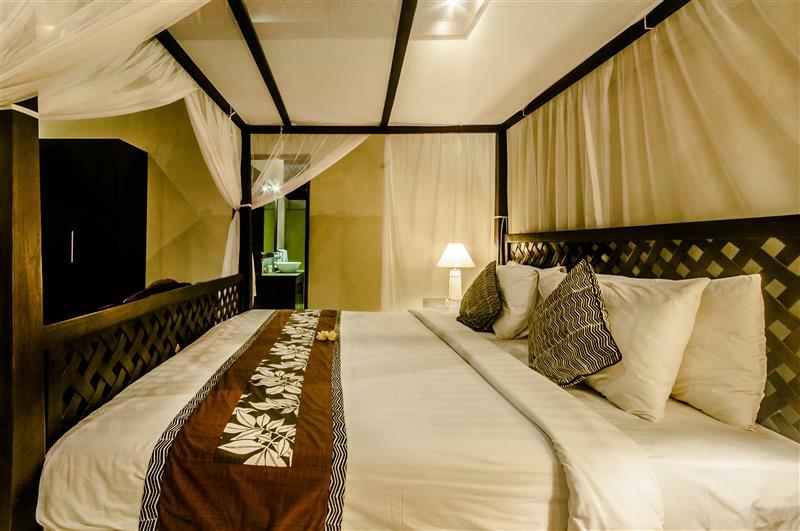 The three king-sized bedrooms cater to the needs and privacy of up to six adult guests. 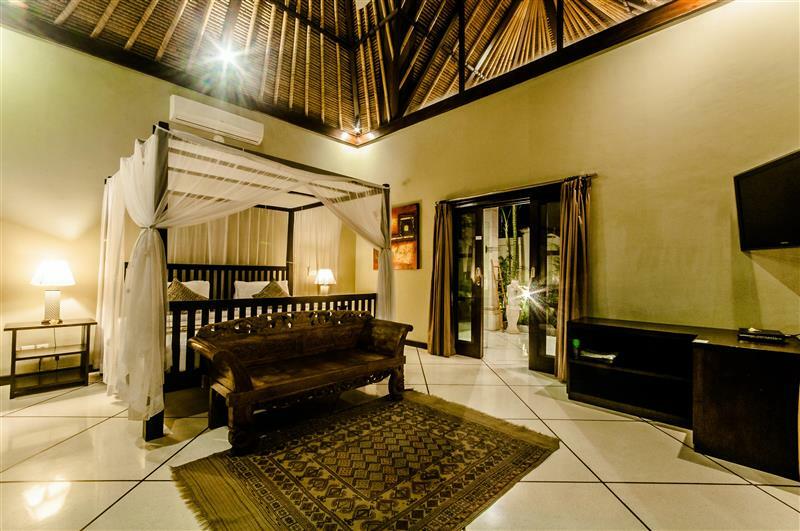 Each room features a traditional Balinese roof of woven thatch and is fully air-conditioned to evoke nights of restful slumber. The same tasteful decor of dark timber furnishings in clean contemporary lines has been maintained in each bedroom. En-suite bathroom facilities are semi-open and ensure indulgent bathing. Villa Kebun is a visually appealing compound that wraps itself around a full length swimming pool with plenty of outdoor space for sun-lovers. 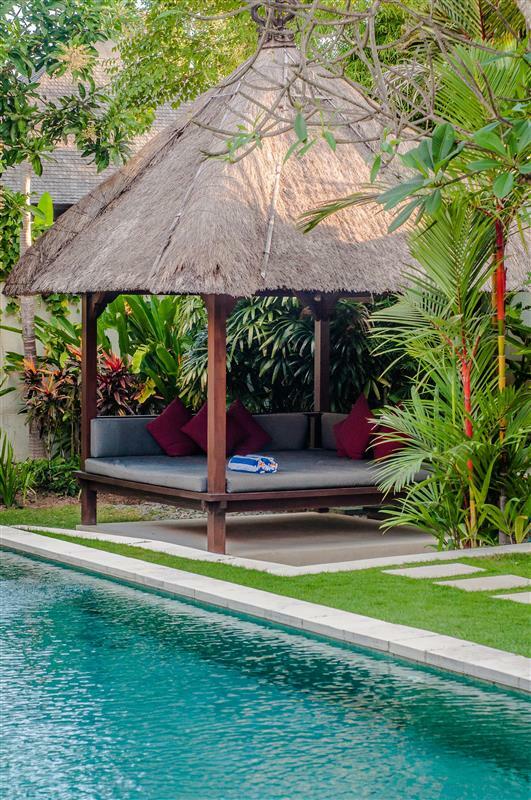 A thatched pavilion over a daybed and covered in cushions overlooks the pool and provides a shady niche to stretch out with a book or take a leisurely afternoon nap. A stone terrace at the very end of the garden has been designed for casual alfresco dining with friends and loved ones. This setting can also accommodate a standing party to celebrate a special event or occasion. My husband and 2 teenage girls stayed in Villa Kebun for 9 glorious nights. 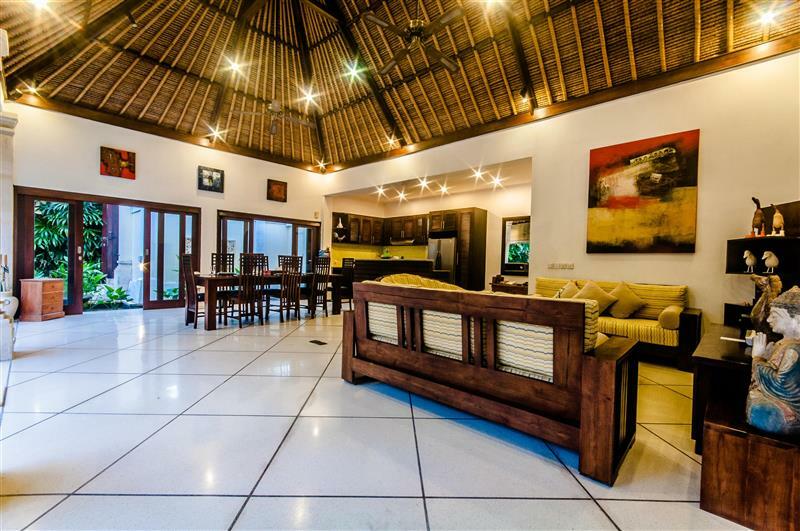 The villa was a welcome oasis of quietness, calm and beauty amongst the hustle and bustle of Bali. The villa itself was spacious (we only used 2 of the 3 bedrooms avail, as the girls shared the large king bedroom. 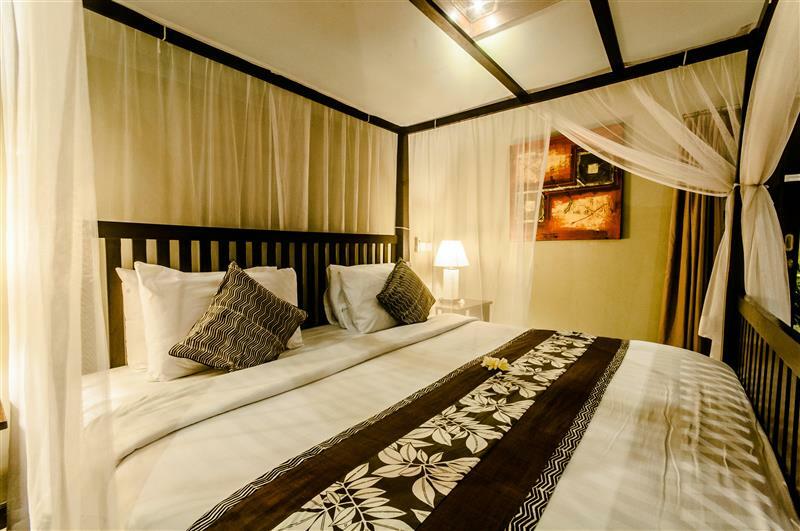 The bedrooms were well equipped with king size beds, mosquito nests, air con, fans. The outside bathrooms were lovely and spacious too. The pool was fantastic and there was plenty of shade and sun baking spots throughout the well kept gardens. Villa Kebun staff were fantastic. Anna cooking our breakfast every morning and Gedeye and Brata looking after us during the day/evening. All staff were friendly and spoke excellent English. The villa itself was in a fantastic area (we stay in this area most times we visit Bali) with only a 5 min stroll through the shady lanes straight to the beach. Laneways behind our villa lead to Bintang Supermarket one way and restaurants etc the other way. Check out Grain, opposite Bintang Supermarket if you want good coffee. We would love to return to this villa as we could not fault it. Thank you. 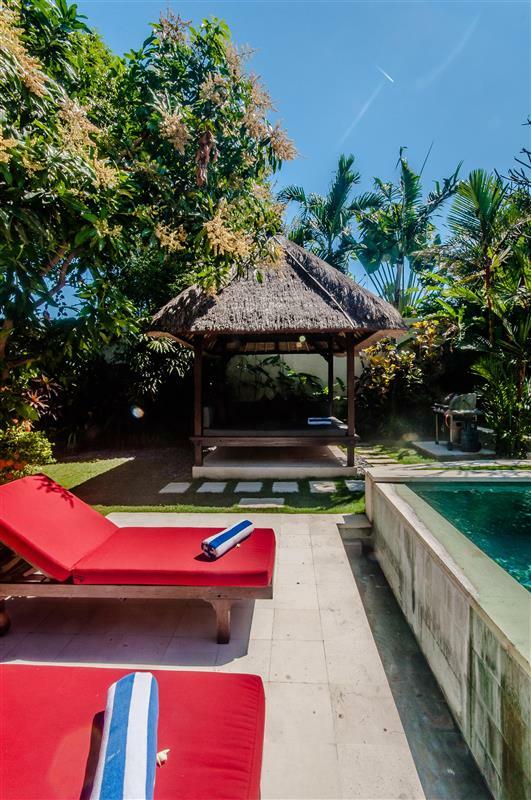 What a joy it is to find a place like Villa Kebun – secluded, quiet and a short stroll from the beach, some of Bali’s best restaurants and major shopping strips in the heart of Seminyak. This has been our 3rd trip to this particular villa, we love it. ‘The garden villa’ certainly lives up to its name with impeccably groomed gardens: we especially love the frangipani tree. There’s plenty of space for 3 couples (each of the 3 rooms has a spacious ensuite) although the opulence with to 2-3 of us was just fantastic. Our week went quickly as we lounged away around the numerous banana lounges and daybed, not forgetting the generous infinity pool – a refreshing escape from the midday sun. Staff were always very friendly, attentive and prompt to all our needs, including making restaurant reservations. Again, thanks for such an enjoyable stay and we can’t wait to visit again soon! 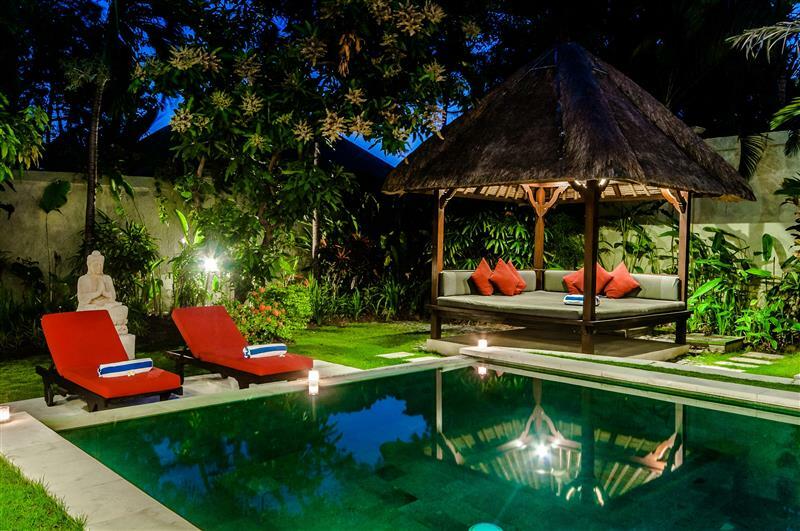 Villa Kebun is an absolutely stunning place to relax and unwind in Seminyak. It’s close to everything, yet peaceful and quiet as soon as you step inside the doors. 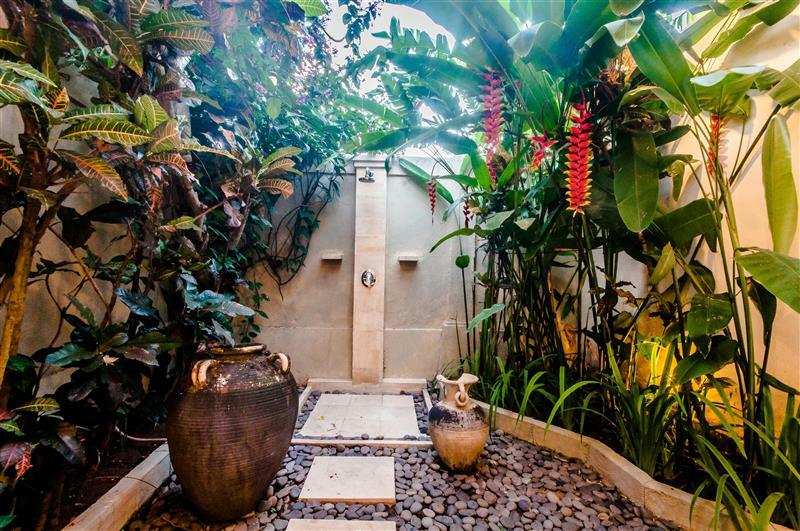 The space itself is incredibly beautiful, with luscious gardens and amazing outdoor showers in each room. The pool is the perfect temperature, and lazing on the daybed is a very easy way to pass the days. The rooms are spacious and well air-conditioned, and the open plan living room and kitchen is the perfect place to relax with family or friends. I can’t speak highly enough of the amazing staff at Villa Kebun. They were so warm and attentive to our every need, and came in each day to keep the place spotless. The kitchen is well furnished with everything you need to cook a meal, or you can have a delicious meal cooked for you by the chefs on staff! We had a wonderful trip and can’t wait to return in the future. Its indeed a Home away from Home! The staff was warm and friendly. Alit,Agung n Gede has really made our stay very memorable. Will we be back? BIG YES But only if Alit and Gede can serve us again. Banyak terima kasih to the great Villa Bugis team! 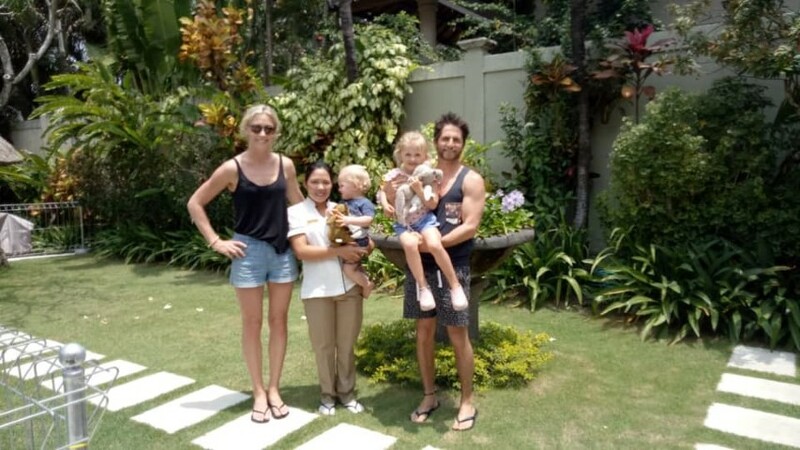 We spent 9 days at villa Kebun with 7 people (toddler, adults, elderly), and were amazed by the beautiful house, and the large pool and green garden.The location of the villa is just perfect, only 5 minutes walk from Bintang supermarket and beaches of Seminyak. This is a precious place for large extensive family holidays. it has three separate bedrooms with its own in-suite bathrooms. Very comfortable and clean. The service was excellent from the moment we arrived at the airport until the moment we left. The staff were always so accommodating and we felt our needs were well taken care of. Agung was extremely helpful, kind and welcoming. Thank you for everything and we will be returning again, soon! From the time we were picked up from the airport till the time we were dropped off, the whole experience was amazing. 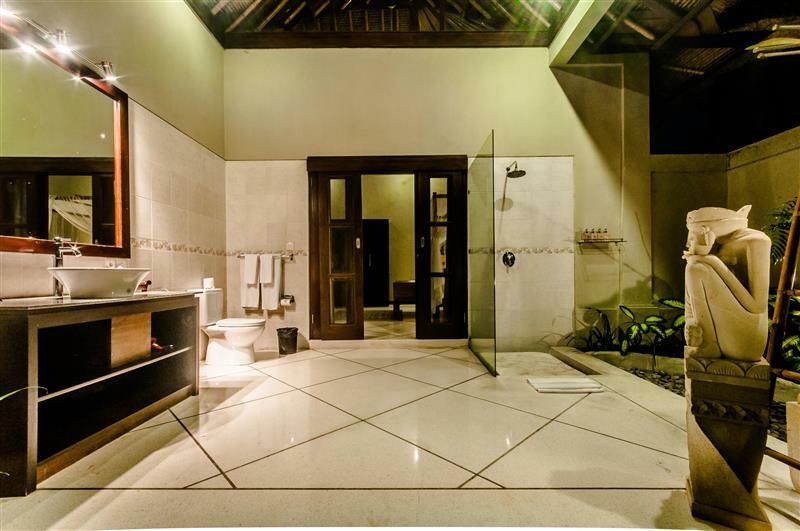 I’m in Bali every few months and this is by far the best Villa I have stayed at. The staff are all brilliant and friendly and arranged a complimentary cake for my niece’s birthday. Very clean and had all the extra touches. Also excellent sound system and very comfortable furniture. Excellent and amazing and I’ll be returning. This is my second time staying at Villa Kebun. I love it here because it is set off the busy roads, but only a 300 metre walk to the shopping strips or beach. It’s amazing how little you hear! Only the sound of the water feature & click of champagne glasses! 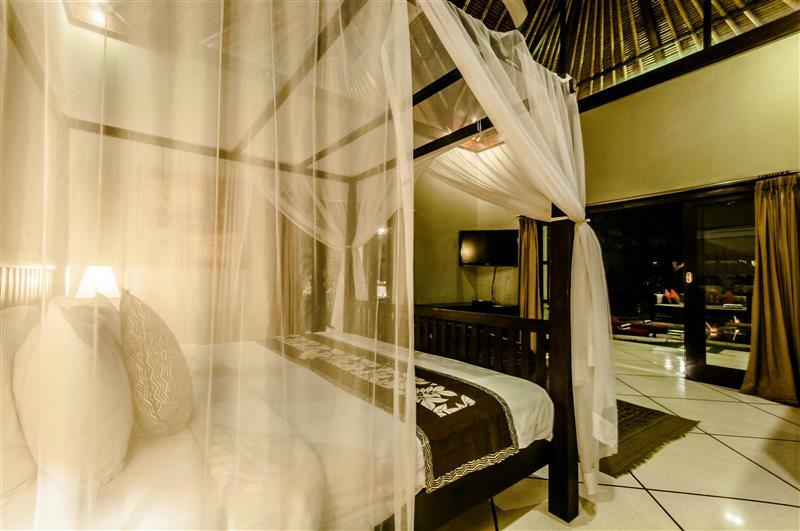 The 3 seperate ensuited bedrooms are a sanctuary to themselves, making it ideal for 3 couples, friends or a family. The staff are very accommodating & friendly, & because they only operate between 8am – 4pm you really are left to relax if that is what you want to do…but, being so close to the great restaurants, bars, shops & massage centres, it was enough to entice me out each day…maybe not before noon though! It’s 5 star accommodation in a 5 star location. We stayed in Villa Kebun for 8 nights and were blown away by the accommodation, service and location. The villa was very well equipped and clean. The staff were always so helpful and the meals were scrumptious. 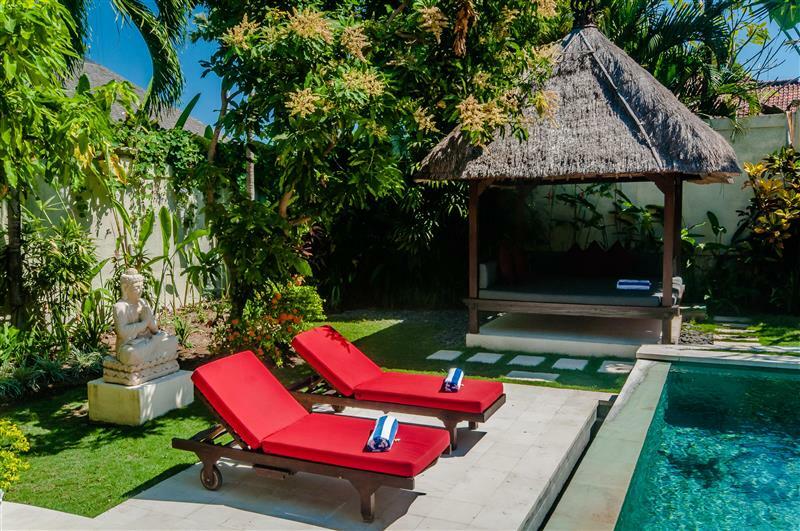 We would recommend Villa Bugis to anyone wanting a relaxing holiday and we will return. We stayed at Villa Kebun for a week over New Years and had a wonderful time. 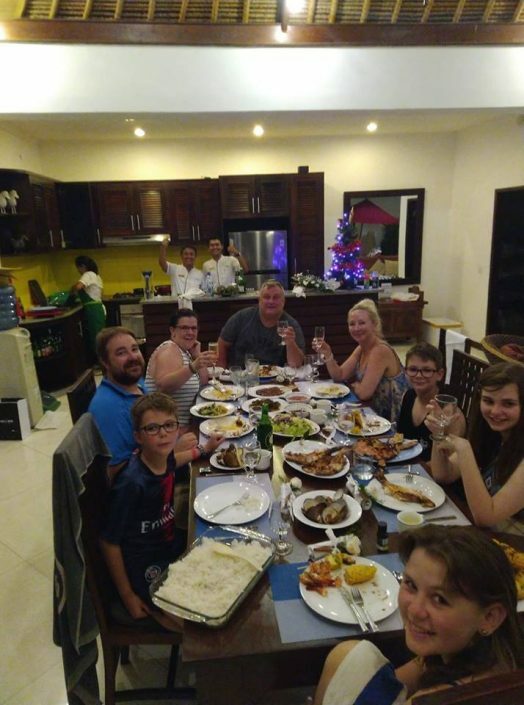 The villa is a much better option than a hotel as there is a ton of room for everyone in the family to hang out, and it is a better value than paying for 3 hotel rooms. The rooms and common areas were nice and the pool was excellent. Location was good–it was just about 5-7 minutes to walk to the beach, and less to get to bars/restaurants and shopping. The staff was extremely friendly and helpful. They helped to arrange taxis and babysitting on short notice. The daily breakfast was quite good, and on NYE we had them cook an Indonesian meal for us that was delicious (only one tip: they made at least twice as much food as we needed, so have them dial back the amount). Overall, we had a great time, and have already booked another Villa Bugis property for next December! Took our adult children and partners to Seninyak for a week. Stayed at the beautifully appointed Villa Kebun for a week. Had the best time ever with 3 spacious King size bedrooms and ensures do no one crowded out. 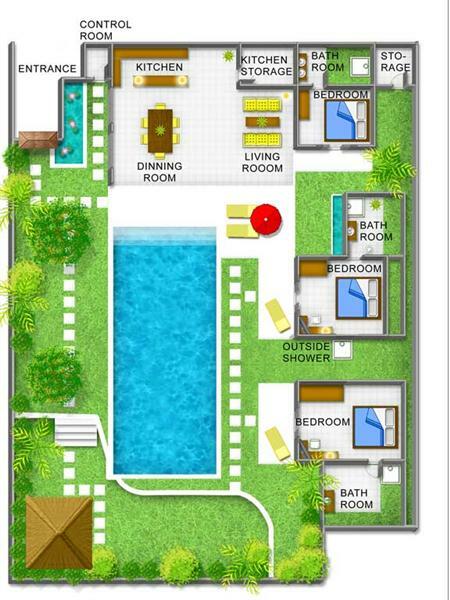 Every amenity provided great kitchen, lounge and pool area with gardens. Staff wonderful and came in every day as suitable times to clean and service the villa. Our in villa dining experience a Bslinese bbq dinner was amazing. Beach, shopping, day spas all a walk away and villa transport bookings for half day and day trips were efficiently organized. We shall return and highly recommend this as an affordable quality way to treat the whole family. This villa is great. Its in a great location and the staff were amazing. We recently stayed here for a week. Our plans were disrupted due to the volcanic ash, and the management of the villa could not have been more helpful. As our flights were cancelled, we arrived into Bali 2 days later than we were booked to arrive. The villa staff were so accommodating. They shifted our booking without penalty, and as the villa was already booked out for the last 2 days, they simply moved us to another villa for the last 2 nights. On one of the nights we had a private BBQ in our villa. The staff organised and cooked everything. It was devine and there was so much food !! All you pay for are the ingredients and a cooking fee. Its a great relaxing night. Villa Kebun, the Garden villa certainly lives up to its name. 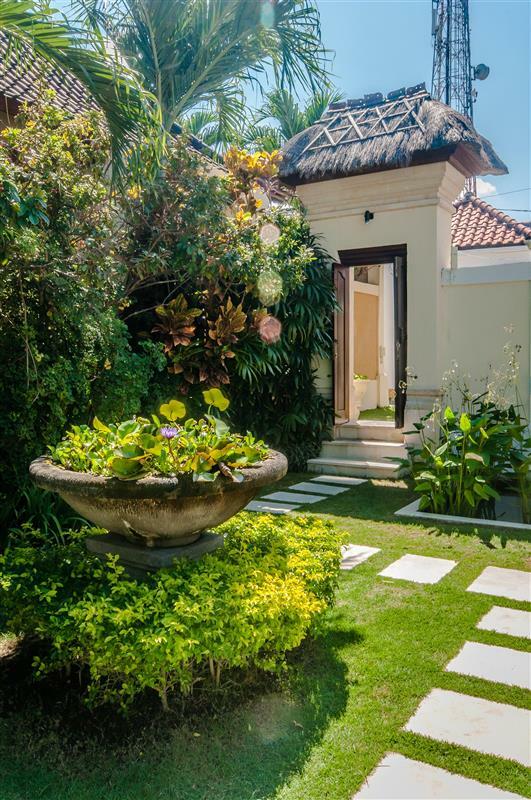 The luscious rainforest style garden is certainly a main attraction as you first walk through the traditional double wooden balinese doors. Visiting Bali a few weeks ago meant we were treated with fresh frangipanis each day as they fell from the tree. The ambience created by this backdrop painted the getaway we were looking for. 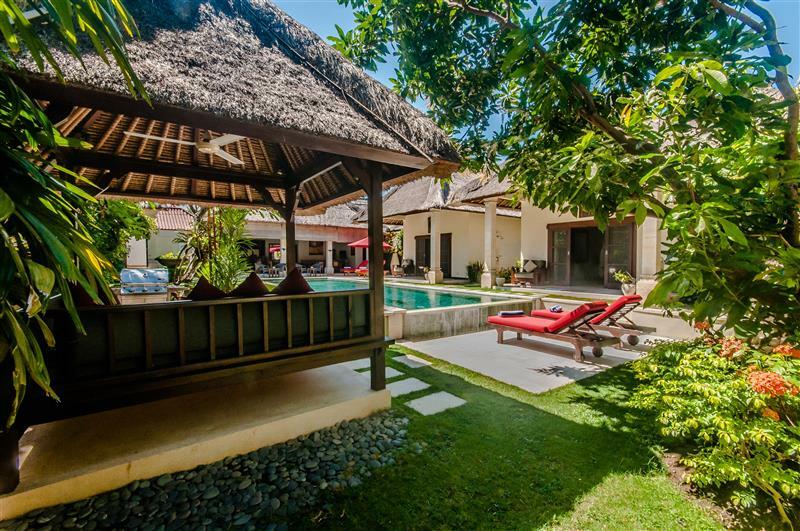 The Villa is a hidden, secluded gem, yet situated only a few minutes walk from the beach, restaurants, bars, nightlife, and the Bintang supermarket in Seminyak. It’s quiet, yet well located, so would suit travellers looking for a variety of different holidays. The pool is certainly one of the major drawcards, spanning most of the length of the property. Much of the day was spent here. The night lighting showcases the Villa in all its glory, lighting up elements around the gardens, rooms and in the pool. The open plan living area with full kitchen including generous bench space and Nespresso machine (bring your capsules! ), gas cooktop, large fridge, dining area and lounge was perfect for the four of us, although would easily accommodate 8 for dinner. 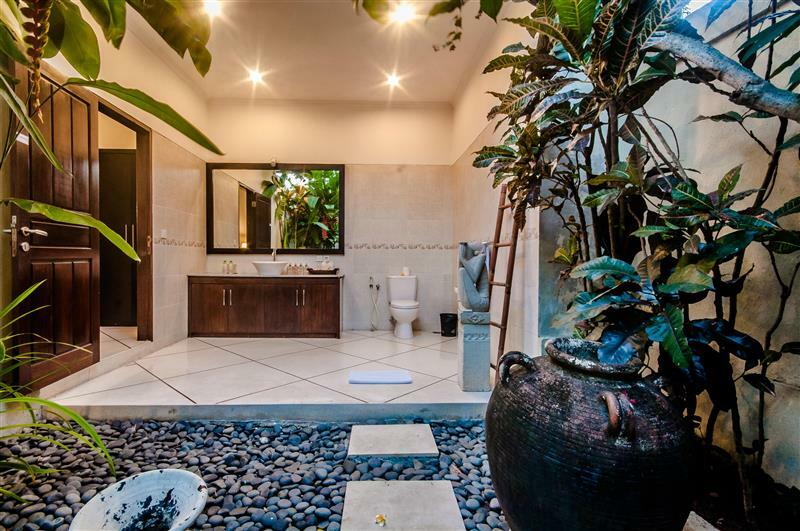 The 3 separate, spacious rooms each have their own ensuite embracing the garden theme, partially open to the elements but still providing complete privacy. Wherever you are in the Villa there’s just so much space! The staff are great and certainly made us feel welcome and special. Get a massage without leaving the day bed / bale or a chef to cook you a meal in-house: the experiences on offer within the Villa alone are vast and all encompassing. We had our family from Oz meet us half way in Bali for a holiday, and Villa Bugis are amazing. You have the luxury of your own villa, and the service of a five star hotel. Privacy when you need, personal chef’s or transport on demand. Seminyak is really maturing; great shopping, restaurants, markets and funky new vibe going down. Great for a sneaky getaway, or meet with a crew with side by side villas or just seperate rooms for a couple couples. We took our young kids and they didn’t want to leave. 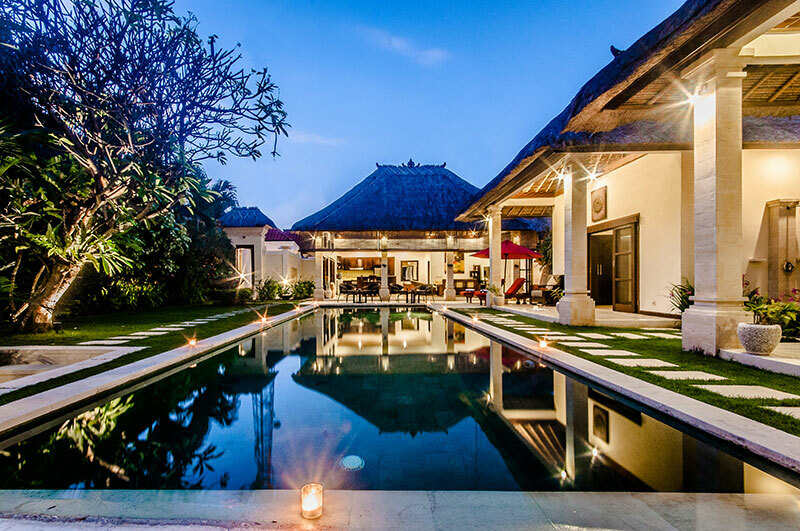 Villa Kebun is located just a short stroll from Seminyak Beach and local shops, yet is hidden away from the hustle and bustle of Bali’s street traffic in a secure and tranquil oasis. Its proportions are generous and the accommodation boasts every modern convenience including wifi, while the large pool and numerous day beds make it difficult to want to venture beyond Kebun’s delightful walled interior. 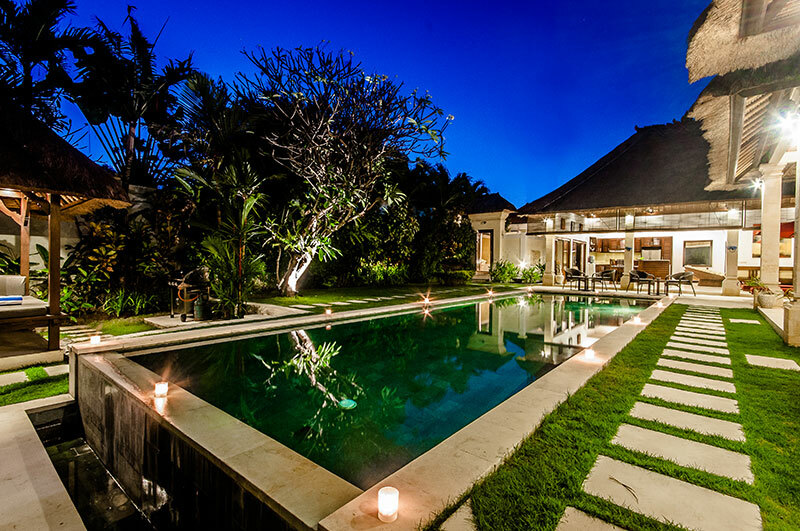 If you do wish to explore Seminyak’s superb selection of restaurants and bars the villa’s staff are both pleasant and helpful and happy to assist, with transport readily available. Otherwise full cooking appliances are available for an evening of eating in. I highly recommend Villa Kebun to couples and families seeking a perfect location and a superb, relaxed experience. Our second visit to Villa Kebun where we feel very much at home now. It is an absolute oasis in the middle of Seminyak. The most beautiful pool, luxurious bedrooms & love the outdoor bathrooms. 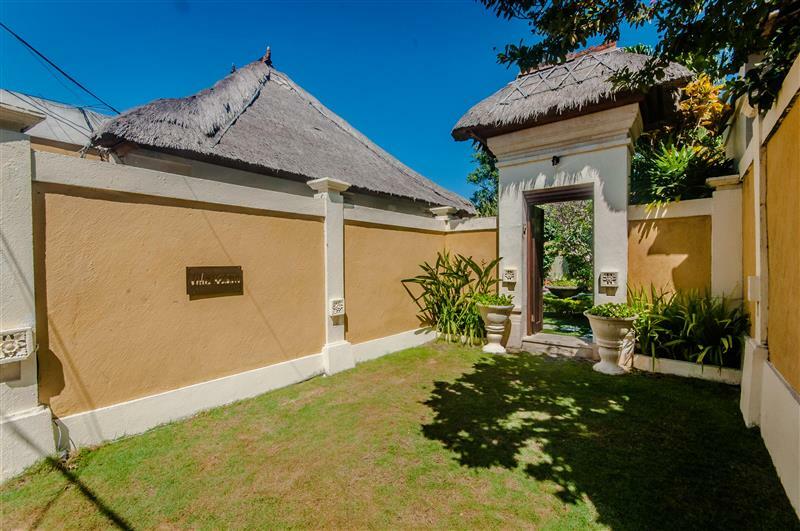 Villa Kebun is located only 5 minutes from the beach & its restaurants. Easy walk to spa’s, supermarkets & fashion boutiques. The staff are amazing, so friendly and willing to do anything for you. Breakfast was cooked for us every morning and we dined one night on the most delicious in-house indonesian banquet prepared by friendly yet unobtrusive staff members. Highly recommend. Stayed here with my friends. Service is great. The guys come in every morning to cook breakfast and clean up the rooms and place. The pool is big and clean which is why we went in for this villa. Seminyak beach is exactly 10mins walk from the place. You can rent beach beds at the beach if you want a quite time. The beach is good. The villa is also walking away from lots of restaurant in the area. Peter is a great host and he made sure we had a great time. Took care of all the arrangements like Taxi’s or sight seeing arrangements. Overall a great experience. We stayed at a villa for the first time and we plan to do it again! 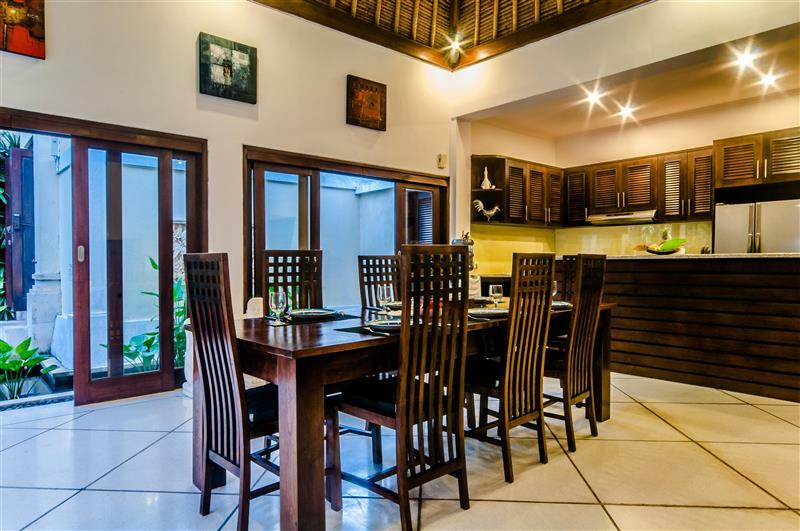 We often travel to Bali as a family with 3 teenage children and Villa Kebun is a delightful 3 bedroom villa with plenty of space for a whole family. Ideally located we have loved returning here for many stays given its convenience and luxurious and private setting. 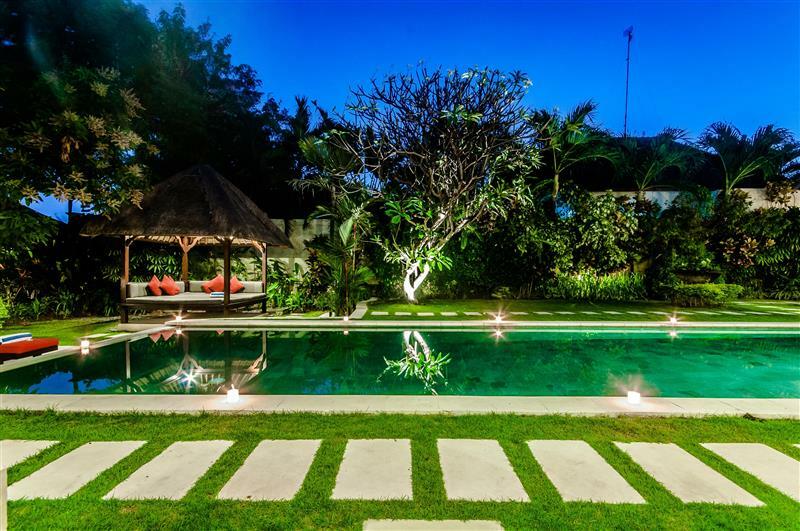 Villa Kebun is situated just 5 minutes from all of Seminyak’s shopping, bar, and restaurant attractions, and just walking distance from the beach, supermarket, bottle shop etc. The accommodation is both generous, modern, and clean, fitted out with modern electronic and entertainment systems, and the Villa’s staff are happy to arrange anything guests request. 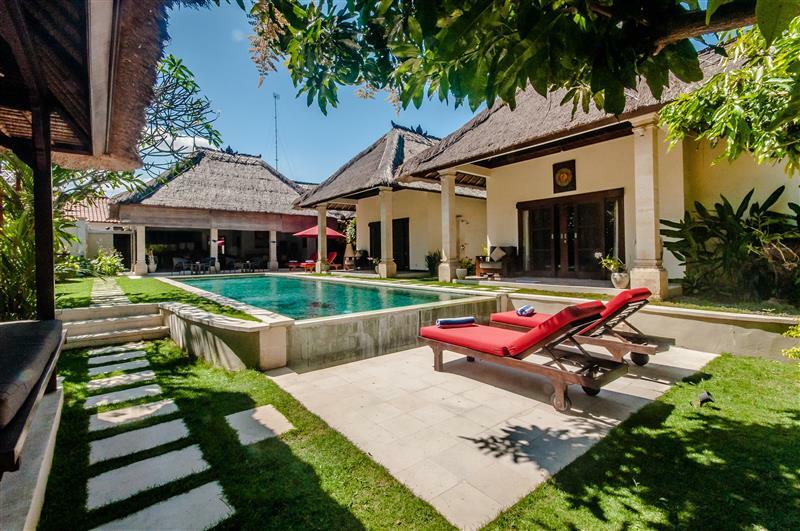 Whether wishing to be out and about and active, or lazing the day away with a book by the beautiful pool and kabana, I can highly recommend Villa Kebun to anyone seeking secure, private, luxury accommodation in the heart of Bali’s premier destination. Staff were incredibly welcoming and helpful. 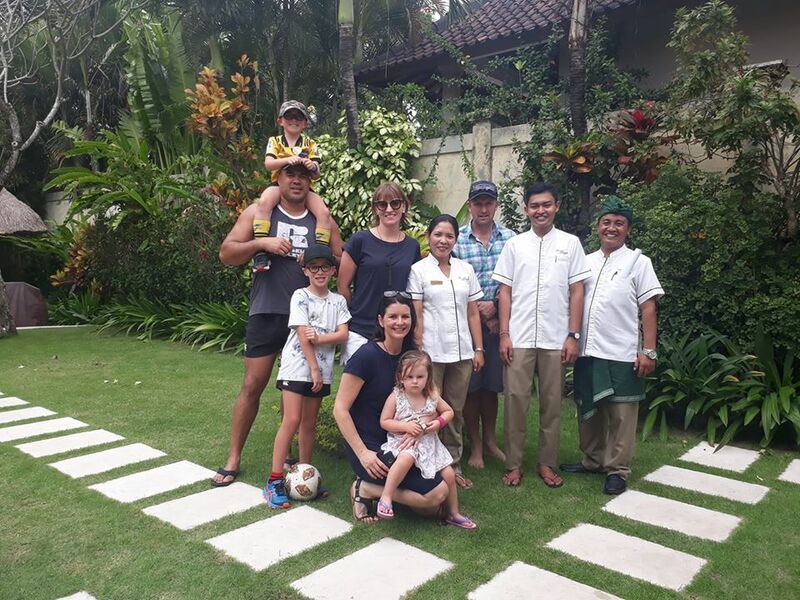 A great place to intro into Bali – Walking up or down the beach was an adventure as was paintball, whitewater rafting and SHOPPING…..
We stayed at Villa Kebun for 8 nights end of December. We had a great experience the villa was lovely, especially around the pool, the staff were amazing always happy to help overall a really good experience. My children 14,12 and 10 loved the villa and the pool and we felt very safe and secure in the area. The villa is close to the shops and a quick walk to the beach. We will defiantly book again. I’m just back from a 10 x night stay with two girlfriends at Villa Kebun. We all had the most amazing holiday, thanks to the facilities provided at Villa Kebun and the service provided by your wonderful staff. Special thanks to Anna and the boys for the great cooked breakfasts each day, to Neillo for her wonderful housekeeping, to Ketut our provided driver, the most patient man, and to Dang the supervisor for helping us with settling in and being their to send us off. Nothing was a trouble for your staff and they really went out of their way to help and support us during our stay and all turned up promptly each day. We so miss seeing their smiling faces each day. I’m looking to return in Bali sometime in mid/late Oct and would like to consider a 2 x bed villa that would be near in location to Villa Kebun, can you please provide details of availability? Thanks so much again for making our stay at Villa Kebun so special. This was our second visit to Villa Kebun in 8 months which is an indication of how much we enjoyed our first stay! We met my husband’s mother there who travelled from England and stayed at the Villa for 2 weeks with our children (3.5 and 1.5 years). Again, we were blown away by the venue – the gorgeous rooms, open plan living, huge pool, landscaped gardens, wonderful staff and convenience to all the local amenities. Due to the nervousness of having an active toddler and an unfenced pool, we opted to have a temporary pool fence installed for our stay (offered at an additional cost through the villa) and it provided the extra security required to ensure our piece of mind. The staff remembered us from our first visit and were very kind to our children again. They were incredibly gracious, helpful and seemed genuinely happy to see us! In summary, we had a relaxing, highly enjoyable stay at Villa Kebun with our children and extended family. We will be returning as soon as we can! We have just come back from 5 days in Villa Kebun with 4 teenagers. The villa is fantastic – clean, spacious, cool – with a great pool and garden. All the rooms are large with four poster double beds/mossie nets and aircon, plus fans – and all have gorgeous “outdoor” showers which are totally private but have a lovely feel to them. Wifi is free and works well in the main body of the villa, in the garden and in the bedroom nearest the kitchen. No signal in the other two bedrooms, but that’s no bad thing. Location is very convenient – 5-10 mins walk down the back lanes to Bintang shopping centre (supermarket etc) and 5 mins walk in the other direction to the beach just by La Plancha (a great beach bar/restaurant). These lanes are perfectly safe for teenagers to use to go to the beach, go shopping etc alone during the day, but I wouldn’t feel happy letting them out alone at night, even in a small group. It’s about a 20 min walk along the beach to the Oberoi area, if that helps place it. Taxis to pretty much anywhere in Seminyak seem to be 40-50k IDR – remember that you are in Gang Melon and then they will be abe to get you home. Staff very helpful – everything in the other reviews was true for us too. We also had a BBQ in the villa one night done by the staff which was tasty and good value. They were also extremely flexible when our flight was unexpectedly delayed. We spent two weeks at Villa Kebun in September with our 2 young children (3 years and 1 year) and loved every minute of it. From the moment we walked through the doors into the courtyard, the service and facilities were exceptional – the cool drinks/towels, flowers, fruit, breakfast the first morning – they really had thought of everything! There are three large self contained bedrooms complete with private bathrooms, TV’s, good storage, safe and mosquito nets. We were here just as a family but you could easily have had two or three independent groups staying (with children) and not feel cramped. In the shared living space the kitchen/lounge/dining were very well set up for entertaining and were well equipped with all the essentials you need (including a great range of books, dvd’s and kitchen supplied). There’s a microwave for sterilising and heating for kids meals too. We thought the filtered water AND bottled water in the bathrooms was a great touch – in the end we were fortunate to not be affected by the water so weren’t using the bottles for brushing our teeth but understand that other travellers haven’t been so lucky so always good to be careful. Our favourite part of the place was the pool and cabana….our idea of heaven! We spent many a day, lounging aruond and keeping ourselves cool and it kept our children well entertained. There is no fence around the pool but for parents with young children, there is the option to have a temporary fence installed (at a fee) which is good to have. The staff were amazing. They service the villa everyday and were so wonderful to our children and friendly. We used them for babysitting a number of times of an evening and our kids loved them. They were also fantastic for providing recommendations on where to go for food, shopping and general directions. 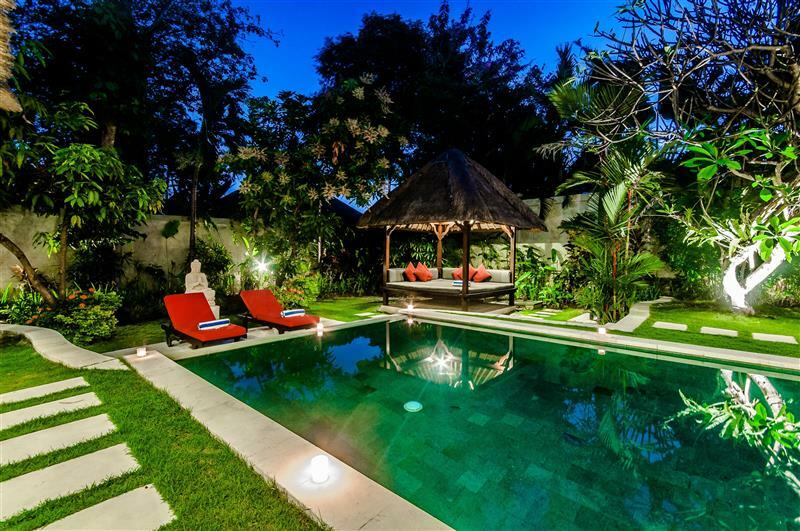 The villa is located in the heart of Seminyak’s shopping district but far enough away from the nightlife to be very quiet and peaceful. It’s a short stroll to the beach and other amenities such as spas, grocery shopping, good restaurants etc. To be honost, it’s difficult to find fault with the place! Overall, we had an absolutely amazing family holiday and would strongly recommend it as a paradise destination for anyone looking to unwind. There’s plenty to do for those who are active and alternatively, if you want to laze around and relax, you always have the option to stay in the villa 24/7. Thank you for providing such a wonderful experience. This place is absolutely amazing! Walk through the impressive front entrance to reveal your own little slice of heaven. Immaculate gardens line a giant 15m infinity edge pool. There’s a Bale with day bed: it’s huge. The 3 large separate bedrooms each have a queen-size, 4 poster mosquito netted bed, air con and ceiling fans, electronic safe; and roomy garden ensuite. There’s 3 cable TVs and DVD players; a spacious open plan living/kitchen area; free wi-fi throughout… the list goes on. 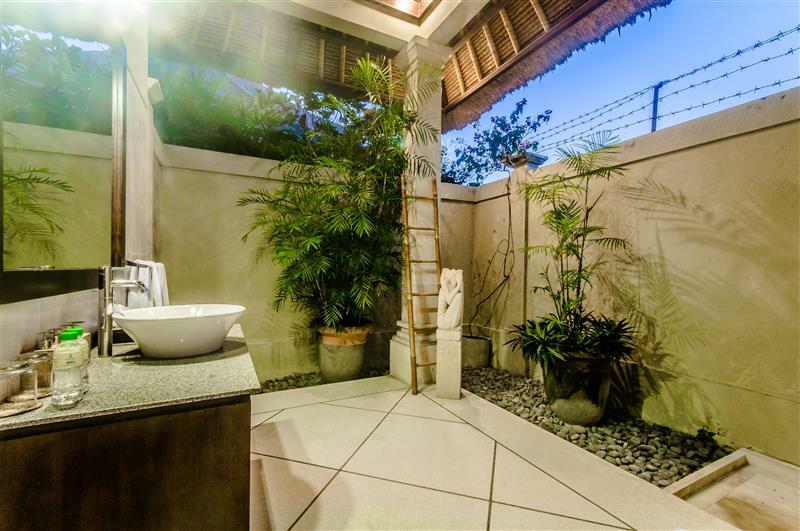 The location is in close proximity to shops, bars, restaurants, and the beach, which are all within easy access down one of the many secluded laneways. 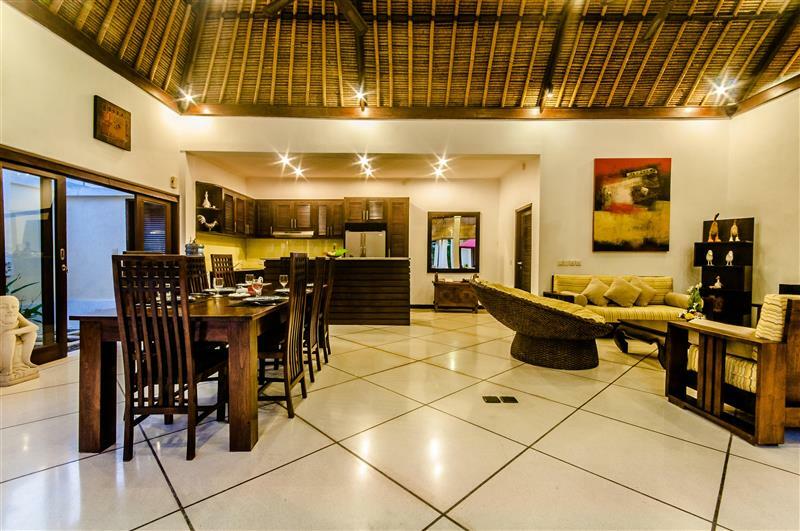 The villa itself is very quiet and feels like a retreat: you could forget you’re in the middle of Seminyak. 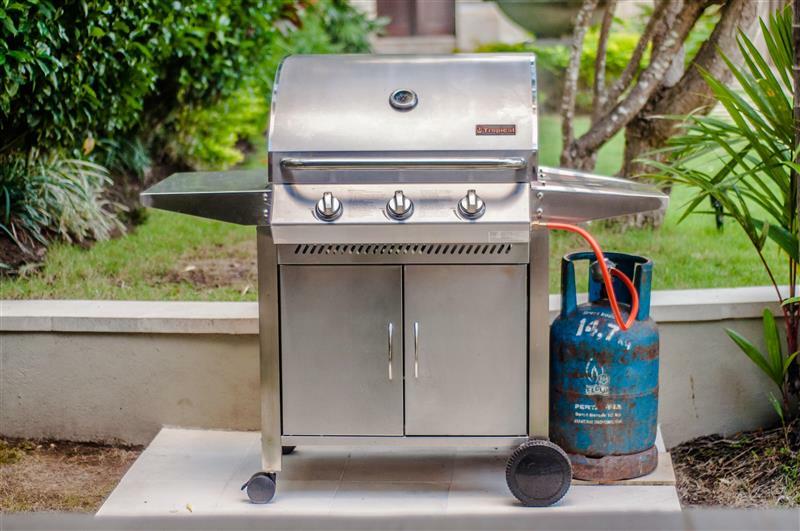 The complete kitchen with gas stove and double door fridge provides all the space and amenities should you need to cook, or have the staff whip something up for you. Welcome drinks and cool towels were provided on arrival as well as breakfast the next morning. The staff are inviting, attentive and professional. They’re available 24hrs a day and always with a smile. We got to know them quite well. On a couple of nights we even popped down to have a beer with the security guards! A small army of workers comes in every morning to clean and also maintain the garden, which is very well maintained and looks stunning. After all Villa Kebun is the ‘Garden Villa’. It’s hard to fault our stay: we’ll definitely be back. Myself and 2 mates stayed at Villa Kebun operated by Villa Bugis for 1 week and were blown away by every aspect of the villa. The villa itself is incredibly opulent. Upon opening the door you are immediately greeted by a giant blue swimming pool; the size of your regular hotel pool. There is a huge open entertaining/dining/kitchen area to relax in, and the 3 separate large bedrooms each with a queen size bed are just amazing. 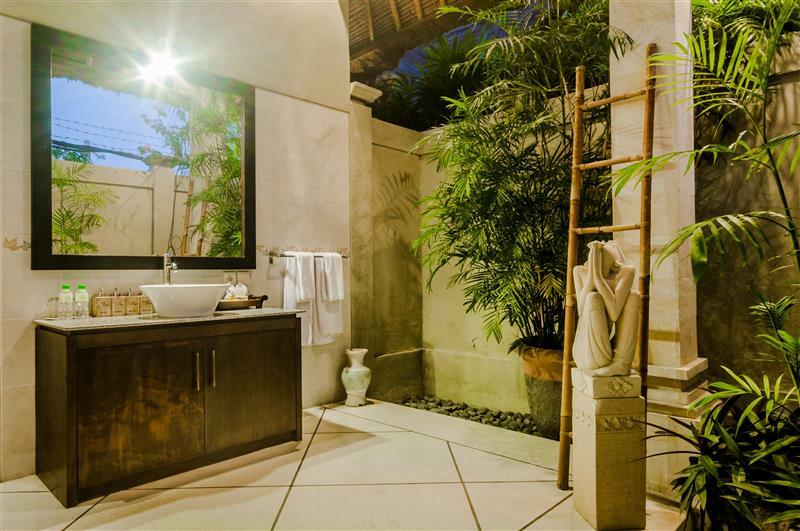 Each bedroom comes with an adjoining private bathroom where you feel as if you are showering in a tropical rainforest – absolute heaven on earth. There is a relaxing daybed covered by a gazebo right next to the pool – the perfect spot to share a late afternoon bintang in serene surroundings. At night the villa lights up to reveal a whole new dimension. 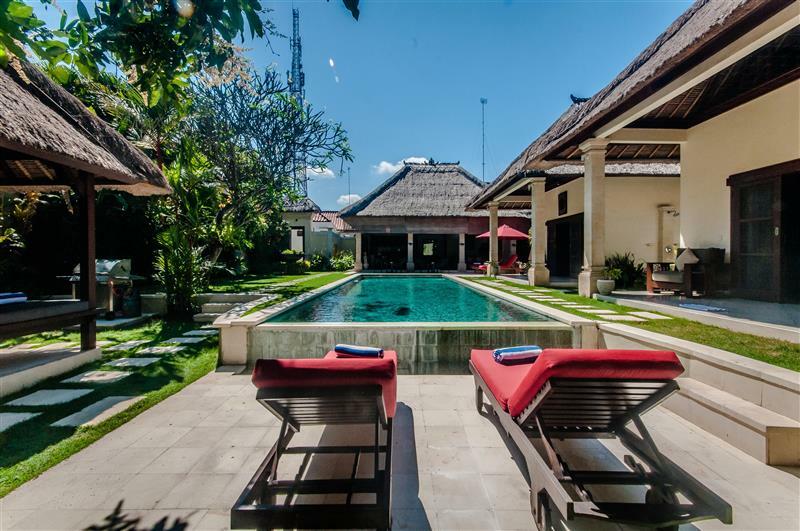 The villa is quiet 24 hours a day and it is a short walk to everything you need, like the bintang supermarket, shopping strips, the beach and multiple delicious restaurants. The staff of Villa Bugis are impeccable. They are extremely polite and will cater to your needs. They clean the villa every morning and will do your shopping for a very small fee. The security guards are very friendly and ensure you feel secure at all times in your villa. 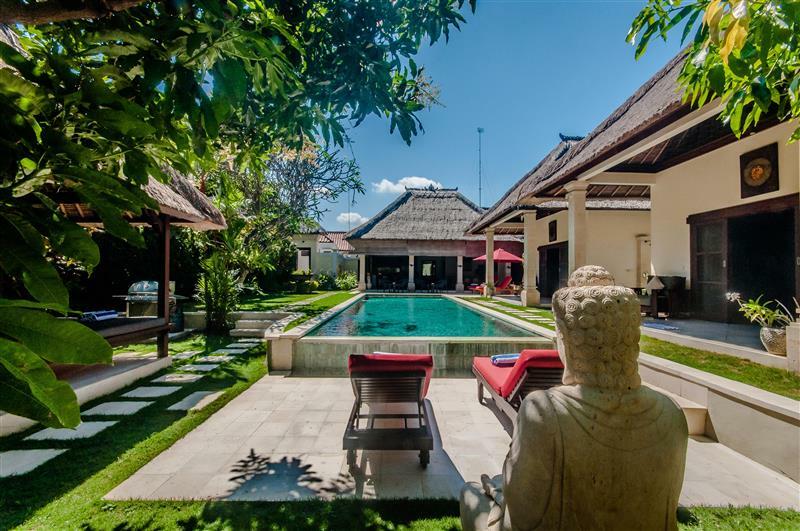 Villa Kebun is definitely THE place to relax when you come to Bali. I couldn’t recommend it highly enough and will certainly be back! Pictures do not do this place justice, it has to be seen to be believed. 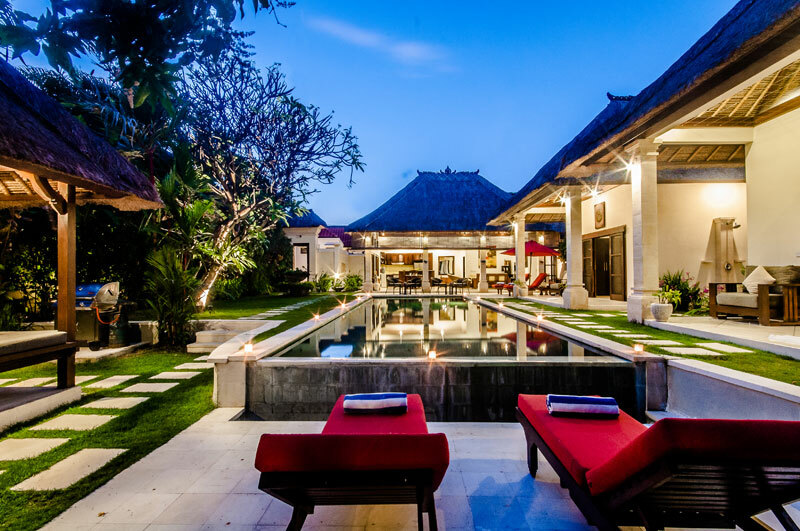 For those who appreciate what Bali, and more so Seminak holidays are all about, you should look no further than Villa Kebun. 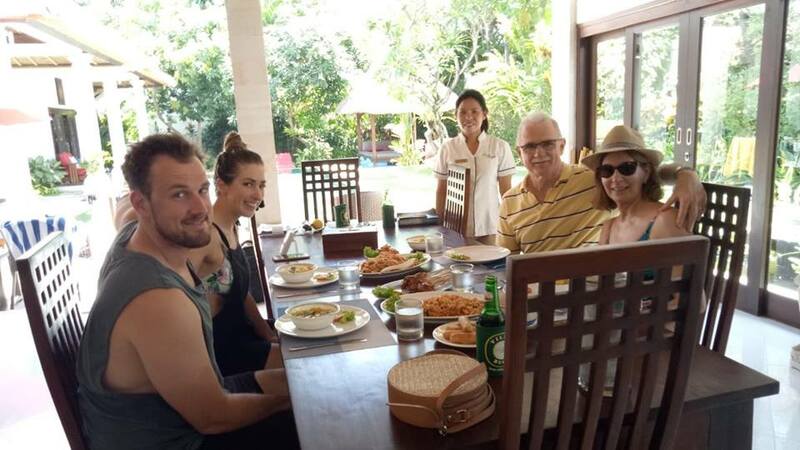 We have travelled to Bali eight times as a couple and a family, and this is our third stay here since discovering it. 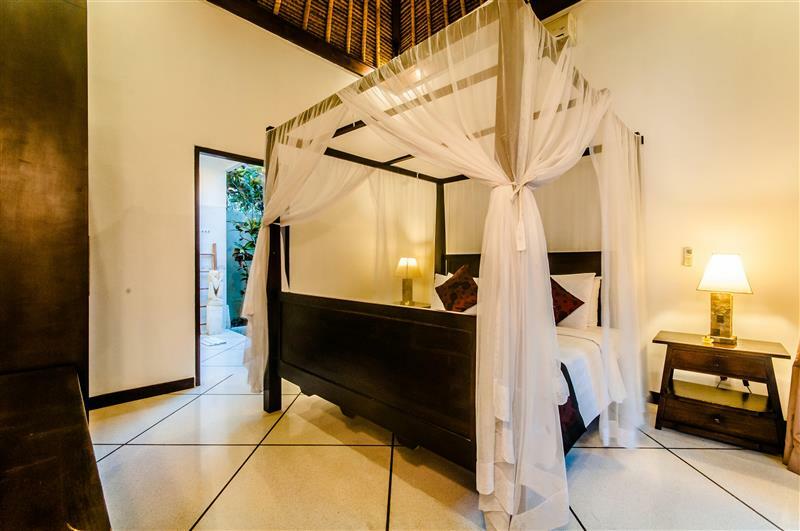 Perfectly located in the heart of Bali’s most popular area, the accomodation is both spacious and discreet, offering excellent amenities, add ons ie cable tv in each room, and great value for money. 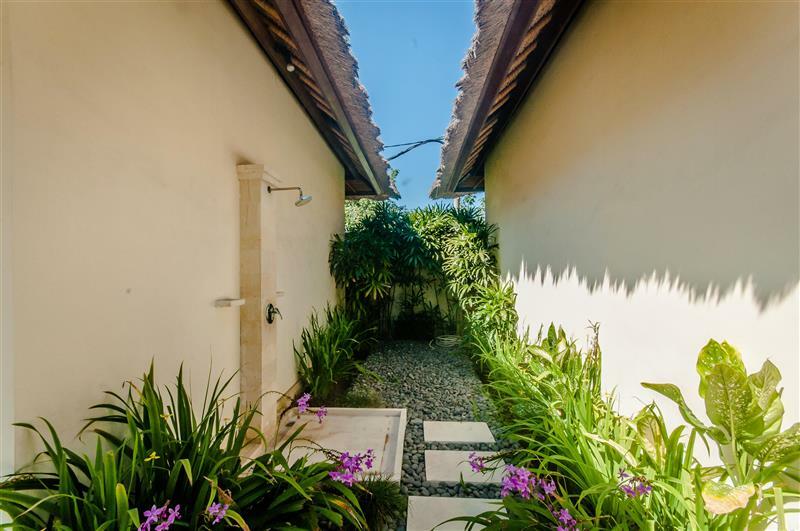 The area’s largest supermarket, bars, restaurants, Seminyak’s famous shopping strip, and the beach are all only a short stroll down delightful lane ways, offering both couples and families a close up view and appreciation of Seminyak life. On top of this, the staff are very friendly, attentive, and helpful, and on hand 24 hours a day. We have no hesitation in recommending this slice of Bali for adults looking to unwind, or travelling with children. Just had a week at Villa Kebun over Easter with friends. It was absolutely fantastic with such a relaxing atmosphere. Very privately located. Excellent facilities that include three large air-conditioned bedrooms and beautiful ensuites, a sparkling pool surrounded by spacious gardens and a large living/kitchen area. Wonderful obliging staff who were eager to please. A stroll to the beach, local facilities and restaurants. The owners have thoughtfully provided information folders for guests. Highly recommend it for families or couples. We stayed at Villa Kebun for 18 days during the school holidays with our two children and found it one of the best villas that we have come across in the past 6 years. Apart from the fantastic open plan living area, large bedrooms and airy ensuites, the grounds and pool were by far the highlight. The large lawn was a great bonus for the cartwheeling daughter and the large bale was a popular spot for the kids to lie around and read books in the morning. Even though the size of the villa was more than amplefor the four of us, it also allowed the dropper-inners and their offspring to spread themselves around and enjoy the big pool and large paved area….It became a great haven for friends to drop in for a few beers and mojito’s after a day at the beach. The villa is in a great location with a short walk to markets and restaraunts, in particular Delicious Onion just around the corner. There is a fantastic little short cut to the beach which is like stepping back in time to how the beach front of Seminyak once was. The staff were as always friendly and very helpful, never without a smile on their face or wave as you walk by. Our kids were often down with the boys at security playing chess and laughing together. We had also requested a ‘Babi Guling’ (Suckling Pig) banquet lunch at the villa, Made sourced and organized for a group of us that was unbelievable….Really authentic and very well priced. Villa Kebun ticks all the boxes for us and we will definitely be heading back next year. We stayed at Villa Kebun in Seminyak for a week over xmas and had a wonderful time. 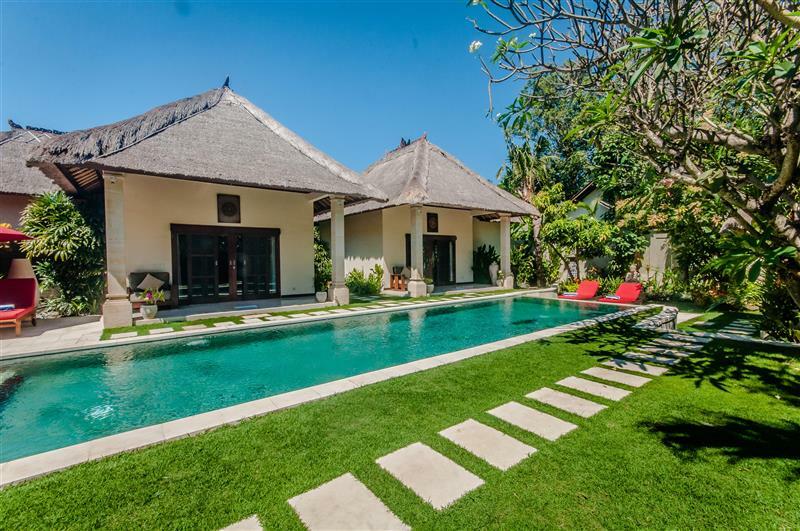 The villa is just spectacular, even better than the photos, really comfortable, quiet, with a large pool, and in a great location just a quick walk to the beach, or the restaurants in Jalan Dhyanapura, or to Bintang Supermarket and Jalan Raya Seminyak. We felt very safe and secure there. 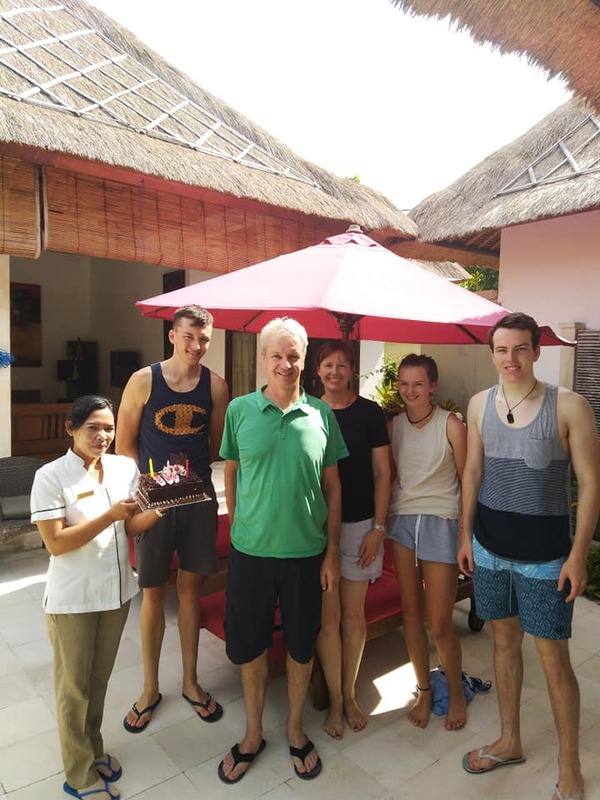 The staff that look after the villas were also great, they were more than happy to come in and fix up any minor issues (one of the aircons was playing up), they cleaned the villa really well every day, and a team of 3 of them cooked breakfast for us one morning which was delicious. They also arranged free airport transfers, provided cold towels and welcome drinks on arrival, and arranged safe transport for our sight seeing trips at very good prices. 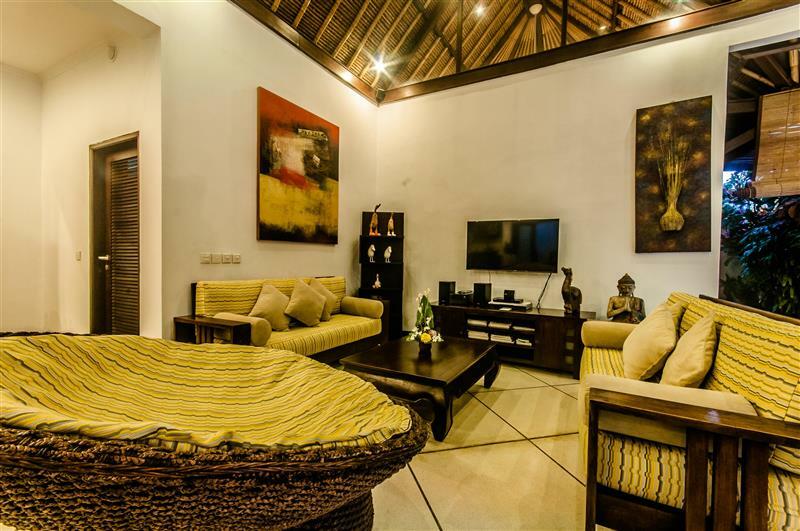 I would recommend Villa Kebun to a family or group of friends who want to relax in Seminyak, there are 3 bedrooms, each with an outdoor ensuite bathroom, and 3 TVs with satellite channels and DVD players so the kids can watch something while the adults relax in the living area. All the beds are all comfortable 4 posters with mosquito nets, and the staff light coils in the open living area every evening. Free wi-fi throughout the villa if you want to stay in touch with the world. There is also a water cooler with free filtered water (hot and cold) and 2 bottles of water in each bathroom replaced daily. The kitchen is really well equipped if you want to cook yourself, with a huge double fridge and plenty of crockery and cutlery. Everything you could ask for in a villa.